Any household where kids live or even visit today probably has a couple (or dozens) of fidget spinners lying around. On Aug. 10, Consumer Product Safety Commission (CPSC) Acting Chairman Ann Marie Buerkle announced the agency was investigating some reported incidents that prompted a warning to parents and caregivers to keep fidget spinners and similarly branded toys from small children because the plastic and metal spinners can break and release small pieces that can be a choking hazard. 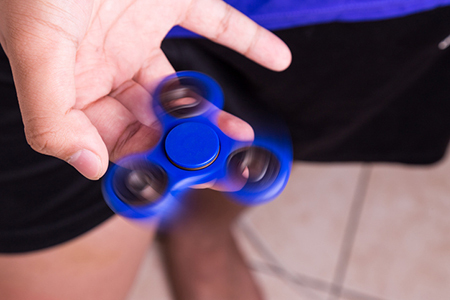 Buerkle said there have also been reports of fires involving battery-operated fidget spinners. She said it is key to use the charging cable that either comes with the fidget spinner or has correct connections for the device. Charging cables are not interchangeable, Buerkle warns. Also, if a fidget spinner is marketed and is primarily intended for children “12 years of age and younger,” its manufacturer and/or retailer must certify it meets standards, including limits for phthalates, lead content, and lead in paint, including the U.S Toy Standard ASTM F963-16, and be labeled as such. Plastic and metal spinners have small pieces (including batteries) that can be a choking hazard. Choking incidents involving children up to age 14 have been reported. Warn children of all ages not to put fidget spinners or small pieces in their mouths or play with the fidget spinner near their faces. Buerkle urges consumers to visit the CPSC Fidget Spinner Safety Education Center for additional safety tips, and urges consumers to report fidget spinner safety incidents to CPSC at www.SaferProducts.gov.